This is one FANTASTIC product! We live on an island at the edge of a very cold, open meadow with no source of fresh water immediately near by. 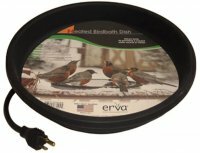 We've had our ERVA Bird Bath Dish for well over 15 years. No bird feeder or bird food has ever come close to attracting birds as a well as this "Heated" Bird Bath Dish. The time has come to replace it. We're doing that without hesitation.